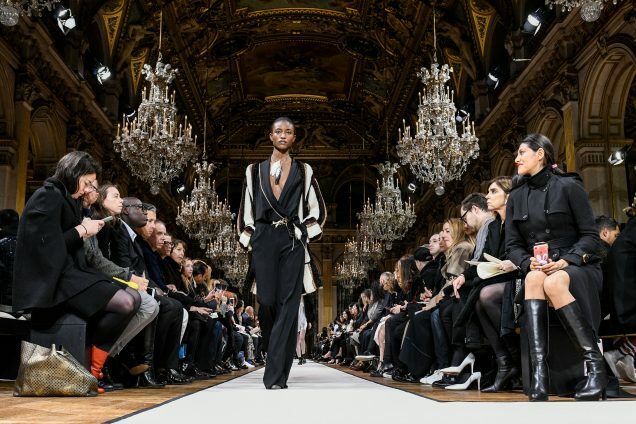 On the eve of Paris Fashion Week, an Instagram post by prominent casting director and model and diversity advocate James Scully made headlines. In it, Scully alleged that Balenciaga’s casting agents, Maida Gregori Boina and Rami Fernandes, made models wait in a dark stairwell for three hours during a casting for the brand’s latest show. Scully also pointed the finger at Lanvin, which, according to “several” casting agents, had asked that it not be presented with women of color. Boina and Fernandes publicly denied the claims, but were summarily fired. Lanvin likewise proclaimed its innocence. The whole truth rests with a select few, but Scully’s post made waves. The would-be Balenciaga models got a heartfelt apology and women of color ultimately walked the Lanvin runway. The takeaway? Conversation — and whistleblowing — is a necessary part of the solution to the industry’s many diversity issues. Thus, we at theFashionSpot offer our contribution to the conversation: a report that examines diversity across New York, London, Milan and Paris and calls out the designers who heeded (or ignored) the industry-wide call for inclusion. For the Fall 2017 season, we examined 241 shows and 7,035 model castings from New York, London, Paris and Milan. According to our data, more women of color walked the runway than ever before. For all four cities combined, 72.1 percent of the models cast were white and 27.9 percent were women of color. 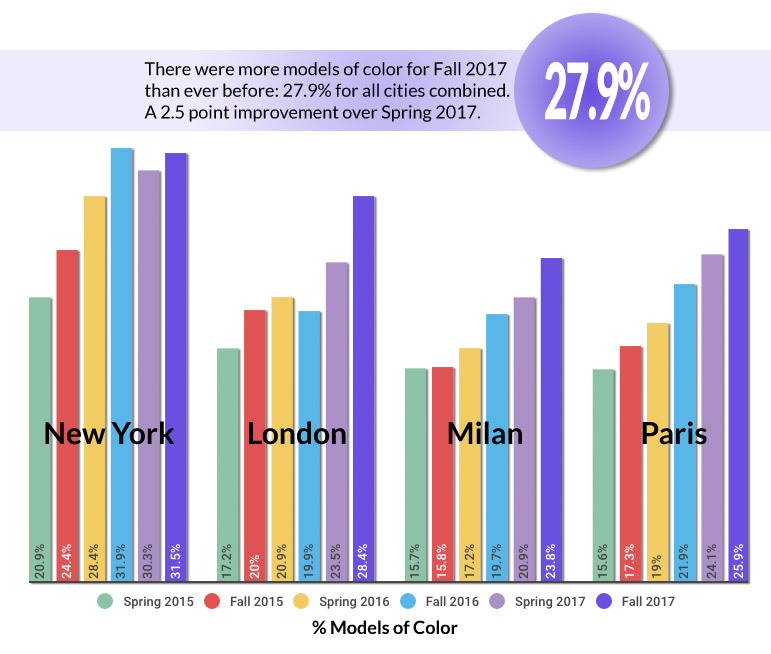 This represents a 2.5 point increase over the 25.4 percent nonwhite models we reported for Spring 2017. For reference, Fall and Spring 2016’s runways were 24.7 and 22.4 percent nonwhite, respectively. In terms of racial diversity, London came in a not-too-distant second. Of the four cities, London again saw the greatest improvement (4.9 points) in its diversity score, jumping from 23.5 percent in Spring 2017 to 28.4 percent in Fall 2017. London’s progress has come in bounds — while models of color had a poor turnout (19.9 percent) in Fall 2016, the following season saw a 3.6 point increase in the number of nonwhite model castings. Paris came in third, with 25.9 percent nonwhite model castings, a slight improvement over the previous season’s 24.1 percent. In Milan, which consistently falls at the bottom of the pile, 23.8 percent models of color walked the runways, a 2.9 point bump from the previous season. Encouragingly, Milan and Paris have now seen steady improvements season over season since Spring 2015. Some designers remain unmoved by the industry-wide call for diversity — or the threat of public shaming by Scully. (Side note: Lanvin ultimately hired 6 models of color, Balenciaga 12, for diversity scores of 15 and 26 percent, respectively.) 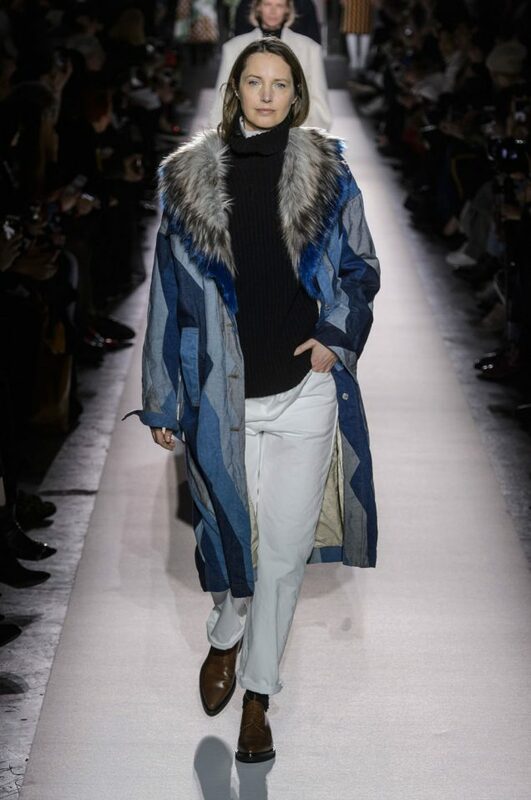 Undercover, Trussardi and Junya Watanabe presented entirely whitewashed lineups, Watanabe for the fourth season in a row. Sharon Wauchob, Chocheng and Comme des Garçons each cast one model of color, resulting in runways that were 7 percent diverse at best. Comme des Garçons is another repeat offender — the brand oscillates between hiring one model of color and excluding the group entirely. In the words of Andrew Bolton, curator in charge of The Costume Institute, designer Rei Kawakubo is “one of the most important and influential designers of the past 40 years.” Kawakubo constantly challenges her audience “to rethink fashion as a site of constant creation, recreation and hybridity.” While we see the merits of fashion as a total escape, in today’s political climate, displaying a (nearly) all-white cast can seem tone-deaf, especially on such a visionary stage. While 6 of the top 10 catwalkers were models of color at New York Fashion Week, white women remain the most in-demand models for all cities combined. 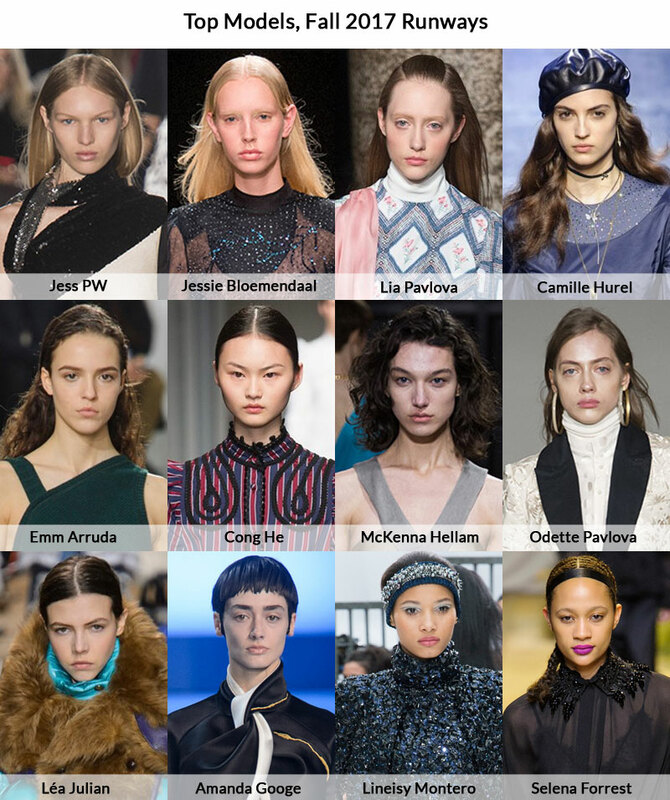 Of the 12 models with the most bookings for the Fall 2017 season, only three were women of color. Chinese stunner Cong He managed to rack up an impressive 42 appearances total by walking in all four fashion capitals. Louisiana-born Selena Forrest and Dominican Republic native Lineisy Montero, both Spring 2017 favorites, tied for the number 10 spot with artist-turned-model Amanda Googe, racking up 37 runways apiece. Overall, plus-size models made up just 0.43 percent of castings. In New York, body diversity had its best season ever with 26 plus-size model castings (a vast improvement over Spring 2017’s 16, Fall 2016’s 4 and Spring 2016’s 14). In Europe, plus-size models continued to be — for the most part — marginalized. Two plus-size women walked in Milan, two in Paris (at H&M Studio’s perennially inclusive presentation), bringing the season total to 30 plus-size women cast in just 11 shows. This marks the first time plus-size women have walked in Milan since we began tracking body diversity on the runways in Spring 2016. Across the pond, Jenna Lyons’ J.Crew Fall 2017 presentation touted a similar message. Once again, the heritage label cut out the middleman. J.Crew enlisted friends, family and staffers to model its latest offerings and, in so doing, put on one of the most race-, age- and size-inclusive shows of the week. It’s worth noting that two of fashion month’s most body — and age — diverse runways featured nonmodels. Suggesting that, ultimately, the best way to make a customer feel represented and included may involve nixing casting agencies altogether. Of course, traditional casting methods aren’t necessarily the enemy of inclusion. “These days we’re pushing to include in our roster people of all ages, races, sizes, body types and genders,” Ivan Bart, president of IMG Models, told The New York Times. “We’re evolving as a society, and fashion, too, has to evolve.” Christian Siriano, who was responsible for 10 of New York’s 26 plus-size model appearances, only hires signed models. “All of our model castings are done with a professional casting agent who solicits models from established agencies,” stresses the brand’s website. Chromat, with the help of casting director Gilleon Smith, put on New York’s second most size-inclusive show, featuring five plus-size models. 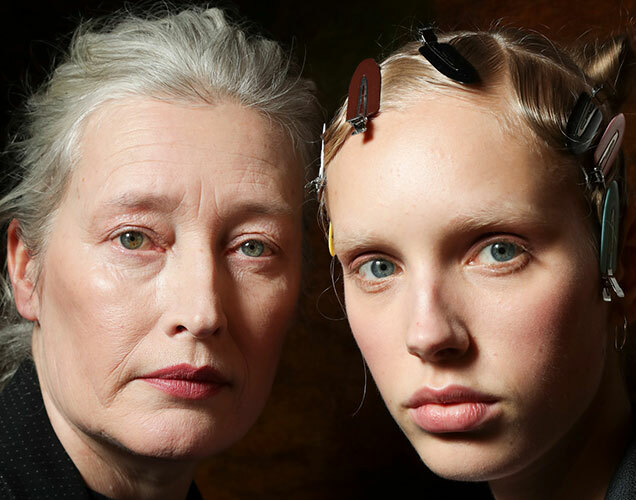 Women in their 50s, 60s and onward turned up more this fashion month than during any season in recent memory. In total, 21 models over age 50 walked the runways of New York, Paris, London and Milan, comprising 0.29 percent of all castings. That’s a vast improvement over Spring 2017’s 13 aged model castings, nearly double Fall 2016’s 11 and about four times that of Spring 2016 (where only five models over age 50 walked). For Fall 2017, every fashion capital saw at least two aged model castings. In London, seven models over age 50 strode the catwalks (a significant jump from last season’s two). New York and Milan contributed six aged model appearances apiece, Paris two. London’s bump in both aged and nonwhite model castings is evidence of U.K.-based designers’ desire to address the nation’s current sociopolitical climate. After all, the week began with an anti-age discrimination protest staged by older models outside of The Strand, a popular show venue. “Fashion has no age limit,” read one sign. Elsewhere in London, Gareth Pugh transformed models he described as “activists, artists, and outliers” into dark-eyed visions of “lethal female resistance.” Among Pugh’s more striking castings was 80s London fashion icon Scarlett Cannon, who hit the runway swinging — a matte black cane, that is. In Paris, Vivienne Westwood walked at Vivienne Westwood, at her successor — and romantic partner — Andreas Kronthaler’s insistence. Dries Van Noten, in celebration of his 100th show, staged an epic reunion of 54 models who’ve walked for him from 1993 to the present, many of them now in their 30s (Liya Kebede, Alek Wek), 40s (Trish Goff, Sylvia van der Klooster, Michele Hicks and Kristina de Coninck) and 50s (the aforementioned Chancellor). While we do not classify women in their 30s and 40s as “aged,” the Belgian master of patterns had one of the most age-inclusive shows of the season. That said, Kebede, Wek and Yasmin Warsame were the only women of color among the extensive model lineup. Dolce & Gabbana’s Milan-based blowout was an all-ages affair. Veteran models Marpessa Hennink and Susan Casden were among the doting (older) moms who accompanied their daughters down the runway. Fellow Milan designer Antonio Marras’ Fall 2017 collection was a love letter to strong women — in particular, Eva Mameli and Pina Bausch. Benedetta Barzini walked, as did celebrated journalist, critic and art director Cristina Morozzi. As we noted in our New York Fashion Week diversity report, the Fall 2017 runways stateside were not as age-inclusive as those of Spring 2017. We (partially) blame Opening Ceremony’s abstention and Rachel Comey’s flight west. The majority (three) of New York’s six aged model sightings happened at J.Crew. Creatures of the Wind, Eckhaus Latta and Tome each featured one model over 50. Parading just one mature model down the runway can seem perfunctory, but Eckhaus Latta and Tome consistently demonstrate their commitment to inclusion. “We wanted to represent all the faces, shapes, sizes and walks of life of the women who actually wear our clothing,” stated Ryan Lobo of Tome. Coming off a banner year for transgender visibility within the fashion industry, it stands to reason that the Fall 2017 season would feature more transgender models than any in recent history. 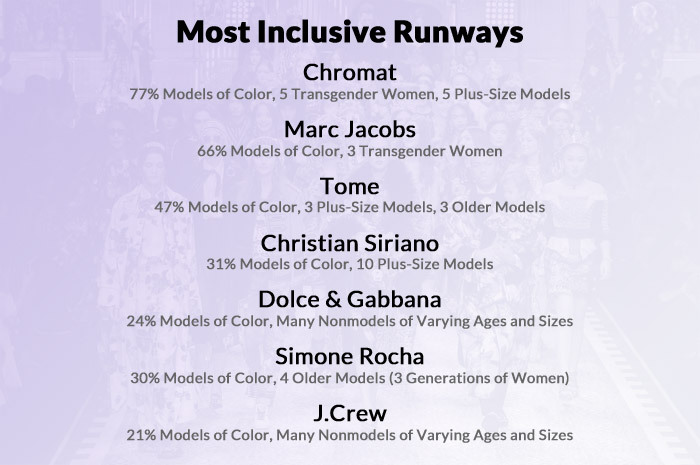 Still, transgender women made up just 0.17 percent of all model castings, or 12 appearances, the least represented group this season. That’s a slight increase from Spring 2017’s 10 and Fall 2016’s eight and a major jump from Spring 2016’s six. Alas, all 12 sightings were confined to New York. With Riccardo Tisci gone from Givenchy, his muse Lea T did not secure her usual Paris Fashion Week spot. Nor did Vogue Paris cover girl Valentina Sampaio book any Milan shows, though she reportedly attended multiple castings. At Gucci, Hari Nef sat front row and palled around with Anna Wintour, but was not invited to walk. On the bright side, it’s no longer unusual to see transgender models on mainstream runways — at least in New York. Marc Jacobs, who gives the final word on New York fashion, hired Stav Strashko, Avie Acosta and unsigned up-and-comer Dara. The remainder of New York’s transgender castings happened at brands known for their “unconventional” approach to casting — The Blonds, Gypsy Sport, Philipp Plein and Chromat. Even after a markedly diverse New York Fashion Week, The Model Alliance’s Sara Ziff observed, “We’re still seeing tokenism and we’re not yet seeing widespread acceptance of models across categories — models of various sizes, ages, races and gender identities.” No doubt Ziff, like us, would be unimpressed by the fact that transgender and, for the most part, plus-size castings stalled after New York. Still, there’s been a perceptible shift in industry standards. High visibility, unquestionably cool brands like Dolce & Gabbana and Marc Jacobs are casting women outside of a narrow spectrum of ethnicity, age, size and gender affiliation. More models of color and women over 40 walked the international catwalks than ever before. It’s a step in the right direction. Thank media watchdogs. Thank fashion activists like Scully, Ziff and Bethann Hardison. Thank the many studies enumerating the buying power of multiracial millennials, plus-size women and baby boomers. Whatever the cause, we’re happy to note that this (admittedly tedious) progress is at least somewhat consistent. Only women were included in the data of this report. Models of color were categorized as those of nonwhite or mixed backgrounds. Nonmodels were not included in our plus-size data.